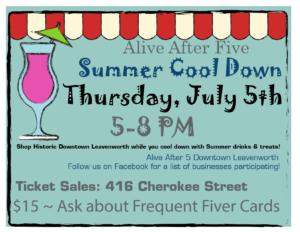 After the hot Fireworks, its time to cool down with some tantalizing treats offered by 12+ shops all around Historic Downtown Leavenworth! Visit with new merchants and old and you sip an old fashioned root beer float or a frozen banana daiquiri! Who knows what will tempt you! This is a ticketed event, $15 . Tickets on sale 29 June!